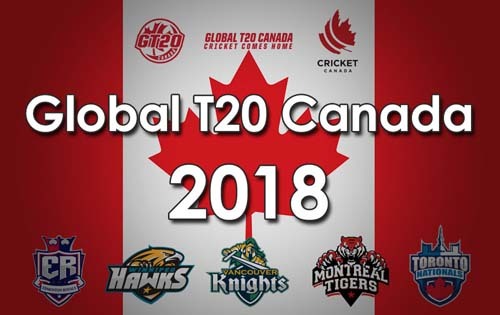 The Global T20 Canada league could not have got off to a more flamboyant start. More than 450 runs were scored in the very first match of the tournament, with loads of boundaries on offer. Toronto Nationals 231-4 (Anton Devcich 92*, Steve Smith 61) beat Vancouver Knights 227-4 (Evin Lewis 96, Andre Russell 54*; Nikhil Dutta 2-26) by 6 wickets. Batting first, the Vancouver Knights got off to a quick start despite Chris Gayle’s (17) early dismissal. Evin Lewis (96) may have missed his century by just 4 runs but Andre Russell’s (54*) explosive fifty powered the team to a huge 227-run total. Kuwait-born Canadian right-arm off-spinner Nikhil Dutta (4-26-2) was the only bowler who could cause a few troubles to the Vancouver Knights batsmen. In reply, Steve Smith (61) and Anton Devcich (92*) made the huge target look easy as the Darren Sammy led Toronto Nationals won the match with four balls to spare. The second match too started on a high note with Ben McDermott (68) and Darren Bravo (54) taking the attack to the Montreal Tigers’ bowlers. Davil Miller’s (35) late blitz helped the team to a 200+ score. Lasith Malinga made a great comeback, giving away just 19 runs and picking up 2 wickets in his 4 overs. Sikander Raza was the highest scorer for the Tigers with 30 runs. Twenties from Sunil Narine and Moises Henriques were clearly not enough to take the team even close to the target. For Winnipeg Hawks, Dwayne Bravo and Junaid Siddiqui starred with the ball, picking up 3 wickets each. Andre Russell slammed a 19-ball fifty, which happens to be his joint fastest fifty in T20 cricket alongside his fifty in 19 balls against KXIP at Kolkata in 2015. Evin Lewis became the cricketer to hit the highest sixes (128) in T20 cricket since 2017 along with Chris Gayle. Having won their first match by a comprehensive 6-wicket margin, Toronto Nationals will certainly start as favourites. By slamming a half-century in the very first match, Steve Smith has announced his arrival back to competitive cricket in style. 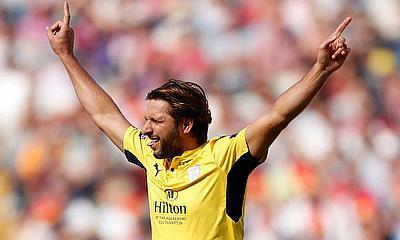 For Edmonton Royals, Captain Shahid Afridi will look to start the campaign on a strong note. In the batting department, he will get support from Umar Akmal and Luke Ronchi. Montreal Tigers’ skipper Lasith Malinga bowled beautifully in his first match of the tournament and will be raring to leave his mark again. Sunil Narine came out as an opener in the first match and is also expected to impress with his all-round performance. Anthony Bramble and Nicholas Pooran are the players to look out for in the West Indies representative team.